Despite Donald Trump’s views about “African immigrants to the US”, the people of Africa have much to celebrate and be proud of, so said Professor Tyrone Pretorius, Rector of the University of the Western Cape (UWC) in his welcome address during the 2018 Africa Day celebrations at UWC. Despite ancient and new examples of African led innovation, Pretorius said Africans are far too quick to look to the West for all things ‘future forward’. “Many forget about ancient advances such as the pyramids at the edge of the Sahara desert, libraries of Timbuktu or the sophisticated trade systems of the Kingdom of Mapungubwe,” continued Pretorius during the event which featured the relaunch of A Feast From Nature– by Renata Coetzee – and a presentation by Professor Ben Turok on Deconstructing decolonisation: African perspectives, historical insights and lessons for the future. “If we need proof of knowledge and skills available in our own backyard, we need not look any further than Feast from Nature – Food Culture of the First Humans on Earth as an example of how we have in us; the creativity, intelligence and resourcefulness to find solutions to challenges that exist within our continent,” explained Professor Pretorius. Through this book, Renata Coetzee looks in her own backyard to uncover solutions for one of the biggest challenges facing humanity today, food insecurity, he added. 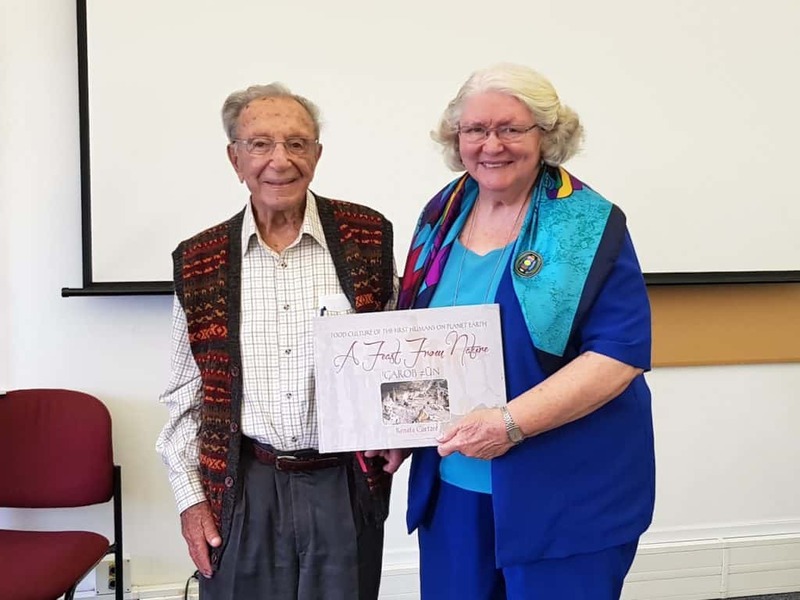 The DST-NRF Centre of Excellence in Food Security (CoE) supported the re-publication of the book to ensure that the valuable research conducted over six decades on the food cultures of various groups in South Africa is further developed. Using a multidisciplinary approach to investigate the food culture of early humans – and later the Khoi – Renata Coetzee provides insights gained through decades of research into how food cultures of the past could hold potential clues for ensuring food security and nutrition in the 21stcentury. Although Coetzee herself was not available for the re-launch, her long-time friend, former student and book editor Truida Prekel, was at hand to present a brief overview of the book which draws on various scientific fields – archaeology, palaeontology, botany and genetics – as well as many interviews with Khoi-Khoin people about how they and their forebears prepared, ate and protected various traditional food sources. The book is available for purchase on: www.sun-e-shop.co.za.